1. Preheat the oven to 170°C, gas mark 3. Season the lamb shoulder. Heat the oil in a flameproof casserole dish and brown the lamb on all sides. Add the garlic and thyme to the pan and pour in the stout. 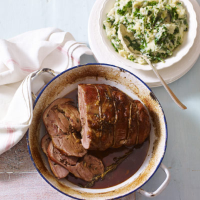 Cover the pan and cook in the oven for 2 - 2½ hours until the lamb is tender and cooked through. Remove the lid for the last half-hour for the meat to brown. Remove the lamb from the pan and rest for 10 minutes. Simmer the lamb juices to reduce by half. Strain into a warmed gravy boat and keep warm. 2. Half an hour before the lamb comes out, cook the potatoes in boiling water for 20 minutes until tender. Drain well and return to the pan. Mash until smooth then beat in the hot milk and seasoning. Blanch the kale in boiling water for 2 minutes until wilted then drain. Melt the butter in a large frying pan and add the salad onions. Cook until softened then add the kale for a couple of minutes until tender. Stir into the mash and season if needed. Serve with the sliced lamb, the juices spooned over and green beans as an accompaniment, if you like. Use any leftover meat the next day crumbled into a broth with onion, celery, carrot, stock, beans or pulses and pasta. The obvious choice with this recipe is a glass of Guinness. Sláinte!